NASA decided Tuesday to begin rolling space shuttle Atlantis back into an assembly building as Tropical Storm Ernesto headed for Florida. 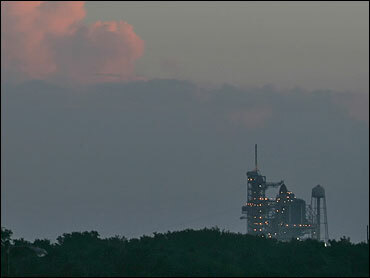 The 12-hour move from the launch pad to the Vehicle Assembly Building was set to begin before noon. "It was about the weather and keeping the vehicle safe," said NASA spokeswoman Tracy Young. NASA rules say the shuttle should not be outside in winds of more than 45 mph. Tuesday morning, Kennedy Space Center was under a tropical storm warning, meaning the area was expected to gets winds 39 mph and 74 mph by Wednesday. The rollback to the assembly building challenges NASA's ability to launch Atlantis in September on a mission to resume construction of the international space station. The earliest a launch attempt could take place once Atlantis is rolled back will be eight days after the shuttle is returned to the launch pad. NASA had wanted to launch before Sept. 7. If it decides to attempt a launch after that date, it could interfere with Russia's plans in mid-September to send a Soyuz spacecraft with two crew members and a space tourist to the orbiting space lab. Having both the shuttle and the Soyuz at the space station would create a traffic jam. Atlantis' main mission is to add a key 17½-ton (15.4 metric tons) construction truss to the space station, including two solar wings that eventually will provide a quarter of the space station's power. Fourteen later shuttle flights until 2010 — the agency's self-imposed construction deadline — depend on its success. The shuttle's six astronauts planned to make three spacewalks during the 11-day mission.